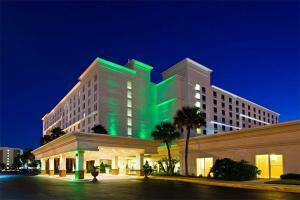 The Holiday Inn & Suites Universal Orlando located in heart of Central Florida's exciting attractions, convention and shopping area. Just across the street from the Universal Orlando Resort. This property features a variety of room types to fit any traveler's needs from deluxe guest rooms with two double beds or a king size bed, and spacious one or two-Bedroom suites with well-equipped kitchenette that includes a microwave and refrigerator. Located 20 miles from the Orlando International Airport, in heart of Central Florida's exciting attractions, convention and shopping area.